Below are videos of my work to make spiral welded, damascus steel gun barrels. Spiral welded gun barrels were made for hundreds of years. Early spiral welded barrels were made in the eastern and near east countries. European conquest in the east, brought spiral welded gun barrels to the attention of the Europeans. The early gun barrels were made from strips of forge welded scrap metal, as well as pattern-welded damascus steel. Pattern-welded damascus steel is made by arranging pieces of iron and steel, or two or more different types of steel together, to create specific patterns in the finished product. The European blacksmiths gained a proficiency at creating pattern-welded damascus around the first of the 19th century. The manufacture of spiral welded gun barrels in pattern-welded damascus steel, was a huge industry for over 100 years, ending around 1930. There were dozens, perhaps hundreds of different damascus patterns welded into these barrels. Some patterns actually included words in the damascus. While damascus steel gun barrels were made in many countries, the barrel making industry in Belgium brought the art to its highest level. Belgian gun barrel makers eventually took over nearly all of the damascus gun barrel manufacturing in the world. As both a knifemaker and a gunsmith, I have a strong interest in making knife-gun combination weapons; often called cut-n-shoots. My desire to use damascus barrels on all of my creations, brought me to researching and testing processes to use in my shop to make these fascinating barrels. It was always my absolute goal, to recreate the damascus patterns that were found in old gun barrels. The only way to accurately recreate these patterns is to wind strips of pattern-welded damascus spirally around a mandrel to form a coil, then forge weld the coil into a solid tube, as was done by the smiths who made these barrels before. After two years of researching, building tooling and testing processes in my shop, I successfully test fired my first spiral welded gun barrel of pattern-welded damascus on September 26, 2012. This first damascus gun barrel is pictured below. The damascus pattern seen on this barrel, is called Crolle pattern. I used this .50 caliber barrel, in the construction of a combination weapon that I named, Laffite's Revenge. On September 8th, 2015, I successfully test fired my second spiral welded damascus gun barrel. 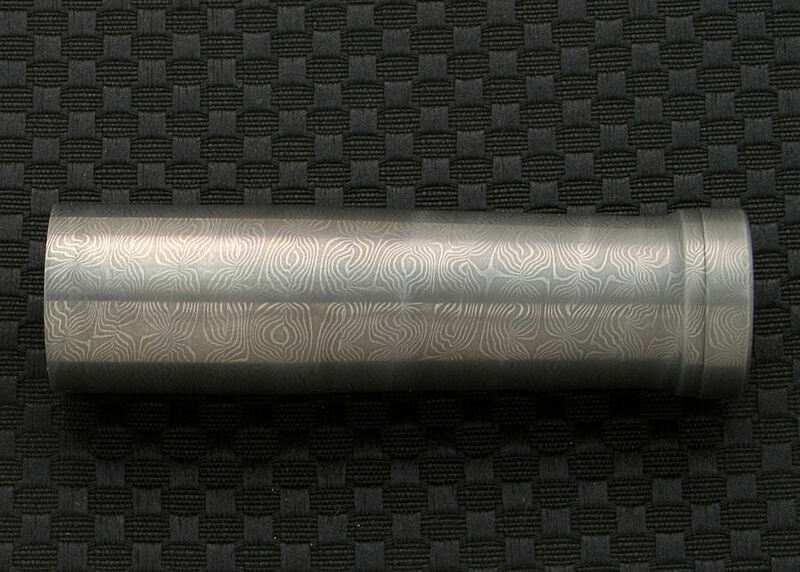 This barrel is in Bernard pattern damascus steel. This .45 caliber barrel, I used in the construction of the Freedom's Steel™ Damascus Pistol, built for the organization, Knife Rights. This pistol was built to be auctioned at the 2015 NRA-ILA Dinner and Auction. All funds raised from its sale, went to the NRA's, Institute for Legislative Action. There were a number of damascus shotgun barrels made, which included the names of people, or firearms manufacturers in the patterns. Below is a link to a document which I wrote, concerning how these barrels were made. Links to a couple of great damascus gun barrel web sites, below.